This newly released image from ESO’s Paranal Observatory shows the super star cluster Westerlund 1 and the newly discovered clouds of glowing hydrogen gas around supergiant star W26. This new picture from the VLT Survey Telescope (VST) at ESO’s Paranal Observatory shows the remarkable super star cluster Westerlund 1. 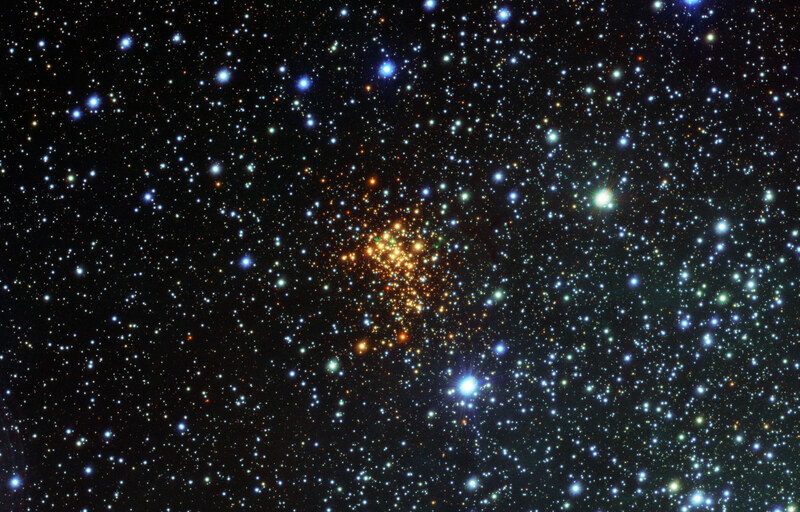 This exceptionally bright cluster lies about 16,000 light-years from Earth in the southern constellation of Ara (The Altar). It contains hundreds of very massive and brilliant stars, all of which are just a few million years old — babies by stellar standards. But our view of this cluster is hampered by gas and dust that prevents most of the visible light from the cluster’s stars from getting to Earth. Such glowing clouds around massive stars are very rare, and are even rarer around a red supergiant— this is the first ionized nebula discovered around such a star. W26 itself would be too cool to make the gas glow; the astronomers speculate that the source of the ionizing radiation may be either hot blue stars elsewhere in the cluster, or possibly a fainter, but much hotter, companion star to W26. 2 Comments on "Astronomers Discover Clouds of Glowing Hydrogen Gas around a Red Supergiant Star"
Very nice picture and report… if only you had pointed out which star is W26. ESO only released this photo, so we weren’t able to point W26 out. Sorry.